Now that the Invisible Library series has become firmly established, the storylines are just getting better and better. Thematically, The Lost Plot is more mysterious and adventurous, drawing heavily from Dragon vs. Fae politics, and there are also strong attempts to involve as many world-building elements as possible. That said though, I do feel this installment takes a step away from series arc that has been developing for the last three books; the plot of this one is a lot more “standalone” than the others, which might make it a good jumping on point for new readers, but of course I would still highly recommend starting from the beginning if you can. 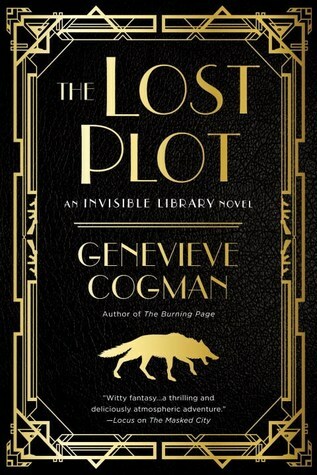 The Lost Plot once again follows protagonist Irene Winters, an agent of the secret organization known as the Invisible Library whose members are tasked with traveling to alternate worlds to procure rare books (and yes, sometimes that means stealing them). When the book begins, Irene is offered a business proposal by a mysterious stranger. The would-be client, clearly a dragon, wishes to pay handsomely for her services to obtain a rare copy of Journey to the West, one of Chinese literature’s greatest classics. However, because of the Invisible Library’s official mandate to remain neutral in matters regarding the Dragons and the Fae, Irene’s first instinct is to decline. Only, it turns out that not all Librarians are as responsible as she is when it comes to playing by the rules. From her contact, Irene finds out that one of her colleagues had accepted a similar deal to find the book from another dragon, and if this information were to get out, it could cause some serious conflict with the Fae and possibly spark an all-out war. Unable to walk away now, Irene turns to her apprentice Kai for help, and together they travel to an alternate world reminiscent of 1920’s New York to seek out the Librarian who has put all their futures in jeopardy. The Lost Plot might be them most entertaining book of the series so far. It’s nice to see the story taking full advantage of its premise, making use of the interdimensional library aspect to transport readers to strange new worlds—or, in this case, exploring interesting historical periods. Anything is possible in this series, and this time, Irene and Kai’s adventures take them to a time of fedoras, Prohibition, and tommy gun-toting gangsters. The Roaring Twenties are one of the most iconic decades in American history, and you’ll find all its hallmarks in this novel, from the instantly recognizable fashion styles to the clandestine speakeasies and all that jazz. As if attempting to extract the Library from the middle of a long-standing Dragon vs. Faerie rivalry weren’t enough, our characters also find themselves having to deal with interfering police chiefs and greedy mob bosses who are all trying to get a slice of the action. From beginning to end, this book was non-stop and fast-paced fun. I also liked how this novel featured a dragon-centric storyline, which of course raises some important questions about Kai’s role in the Library. The ending with the courtroom-like setting and suspense was almost more than I could bear. However, as someone who has followed this series since the beginning, I noticed too that the focus has shifted slightly away from the conflicts of the previous novels, with the scope widening to encompass the Invisible Library’s role and exploring its significance in this world. This was something I’d wanted for a long time, so I was quite happy to see The Lost Plot go down this path. That said, there are some trade-offs. Here you will find little development in the areas regarding Alberich or the mystery behind Irene’s parentage, for example, and for those answers, I suppose we’ll have to wait for a future sequel. Vale fans should also be forewarned that he does not feature much in this novel, a point to which I will admit to a twinge of disappointment myself, since I’ve grown to like his character a lot. But oh well, you win some, you lose some. All in all, The Lost Plot was another exciting and satisfying sequel which reminds me once again why I’m glad to be reading this series. There’s a reason why I keep coming back for more. If you’ve been enjoying the mysteries of the Invisible Library and the interdimensional adventures of its agents thus far, then you’ll want to pick this one up too. I so want to pick up this series one day! I had a copy of book one but ended up giving it to another blogger when I realized I wouldn’t be getting to it anytime soon (and she was soooo excited about the book). This fourth one sounds really good! Is the series over with this one? Nope, there is at least one more book, it seems! And I can’t remember if she had been planning to stop at five or make this a continuing series, we’ll see I guess! Great review!!! I love this series so much, cannot wait to get my hands on this fourth one 😁😁 Really happy to read that you enjoyed it! I’m mad at myself for not starting this series sooner, and wow, I can’t believe it’s up to book 4 already! Glad you enjoyed this! From Genevieve’s interviews the other days, this series sounded like it had a great premise! It really does! As I was saying, anything is possible with a premise of an Invisible Library being the portal to an infinite number of worlds and times! Man, I really need to continue this series. I have no one to blame but myself as I loved the first one and just fell behind due to other books. Personally I want to learn more about Kai. On my list! Great review! I love so much when a series book can be a standalone. I wish they were all like that. It’s great to hear that this series continues to be good. I’ll have to pick up the newest one soon. I’m loving this series – I’ll have to read this one soon. Hope you’ll enjoy it as much as the others! Yet another series that I need to get cracking on. Everyone seems to have so much fun with it…plus libraries! I’ve not heard of this series but I love the concept, I shall check out book #1 of the series.